In another post we receive frequent comments with user complaining about over scratched or damaged pin. So if you have got Airtel Coupon PIN overscratched or you have received a damaged pin from shop, all I can say is, don’t panic you can still get its full value! Just follow following simple instructions. 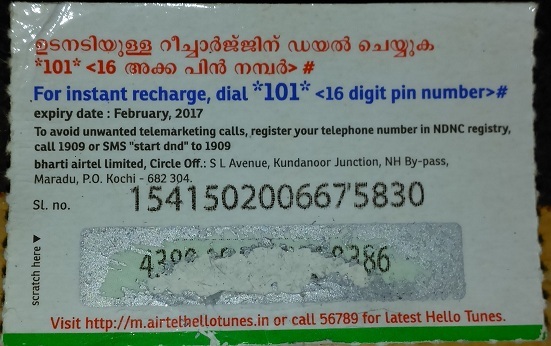 Got Airtel Coupon PIN overscratched, Serial Number in tact, what to do? If you have got Airtel Coupon PIN overscratched, and are unable to read digits and have unharmed serial number, you may need to do either of two things. One, go to the shop where you purchased the coupon from. Ask them to replace the coupon. They should be able to replace it without any extra cost, since it is not going to cost them anything other than formal process to get it fixed from the service provider i.e. Airtel. It is possible that they might be able to return it. Well this is a matter of courtesy and you may not force them to do so I guess. However if you have received a damaged voucher they must replace it for the sake of consumer relationship, failing in doing which they might attract a consumer complaint against them. The alternate and easier way I think is to call Airtel customer care and get it sorted out. All you need to do is call Airtel 121 service. Call 121 or 198 from your Airtel number and inform them about the situation. They may ask about the serial number of the code voucher. After a simple process they should be able to credit your mobile number with the value of the voucher. You can also email airtelpresence@in.airtel.com with voucher serial number and your mobile number and they should be able to send money to your mobile soon after they check the email. 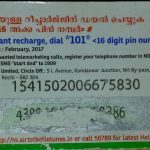 What if Airtel Coupon PIN overscratched and Serial Number was also damaged? I hope this article about Airtel Coupon PIN overscratched helps.